A lovely sunny flow from inside to out with large floor-to-ceiling ranch sliders allow the sun to stream in all day and give an outlook towards the marina. With all day sun and warmth the covered balcony is the place to relax day or night. The colours of the London Plane trees in Victoria Park are always changing with the seasons, and are a great backdrop as you enjoy the easy walk into town. Relax on the couch in the afternoon sun. A great place for a siesta. A fully functioning kitchen with a complete table setting entertain or a night in. The bar leaner that serves as a dining table, extra kitchen space or somewhere to place your laptop. The ultimate morning wake up. Press the nespresso button for the perfect coffee, use the teapot to brew a delicious cup of tea, or a have a yummy hot chocolate. An abundance of light from the large slide back windows in each of the bedrooms, with queen size beds and plenty of closet space in both.
' Pania - The Fall' depicts Pania, a figure from Maori mythology. She left the sea people to marry a chieftain. It is an artists proof by renowned NZ artist Rakai Karaitiana. Paina has special significance to his tribe near his hometown of Napier. Side tables in both bedrooms by Auckland local Susan Robinson. 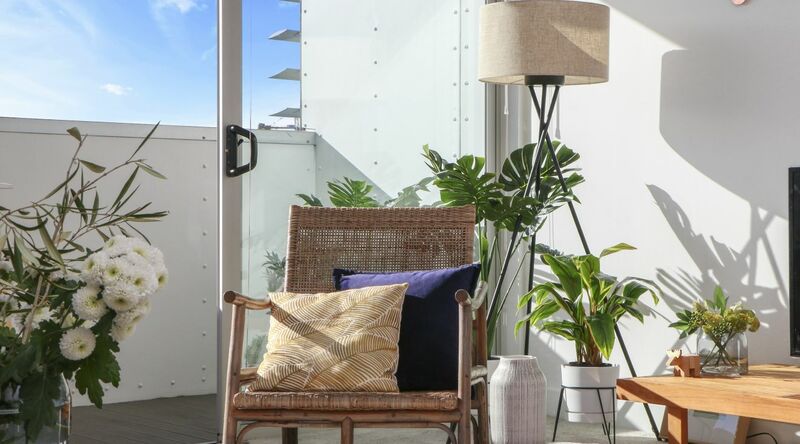 From both of the bedrooms, you can see the trees of Freemans Bay, as well as the New World gourmet supermarket which is just a couple minutes walk away. Bathroom with spacious walk-in shower. Plenty of storage and power points in the cupboards hidden behind the mirrors. Walk past the park-like setting between the apartment and the car park. Catch the changing light all day from dawn to dusk in our place that we've thoughtfully furnished with a mix of NZ and mid century original design pieces, some that we've had for years and others that we've only just recently discovered ourselves! The location is simply outstanding. 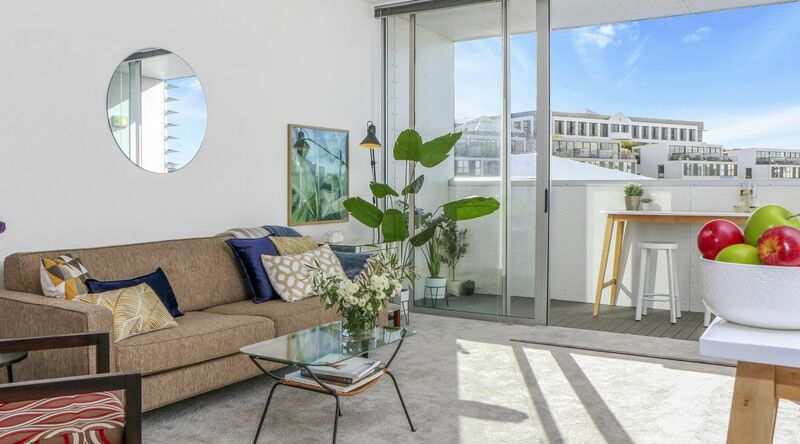 Beaumont Quarter is located little more than a stone's throw away from the hustle and the bustle of the city, yet tucked away in the best fringe location Auckland has to offer. 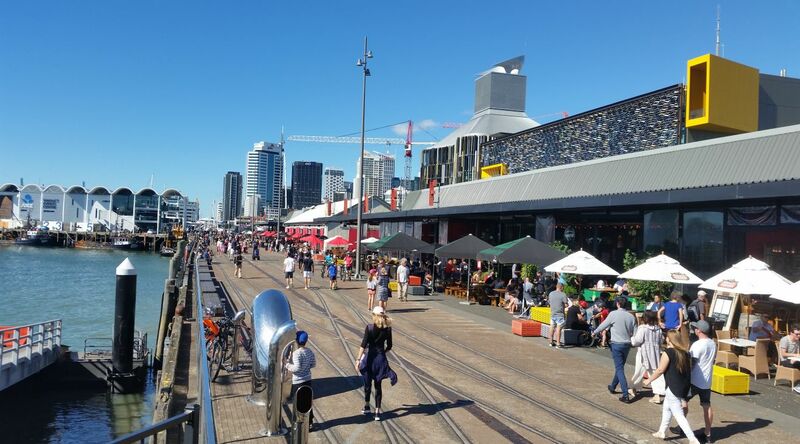 We isolated from the noise of the central city, however it's just a short 5-15 minute walk to Wynyard Quarter, Ponsonby and much of the CBD. Our guests frequently comment on how quiet Beaumont Quarter is given its central location. High ceilings and an abundance of natural light through the north-facing floor-to-ceiling ranch sliders make this a light and airy, spacious apartment. The balcony was just made for alfresco eating and drinking. Directly north facing, it follows the sun from sunrise to sunset while the mast tops remind you how close you are to the marina. All day light continues inside to the spacious living area with seating designed to kick back and enjoy the warmth and changing light. The apartment has just been renovated with attention to the details that matter. Be welcomed home by the plush carpet with extra thick underlay, listen to an original Technics stereo which surrounds you with your own sounds, and press the button for an indulgent Nespresso Lattissima Touch flat white or short black. This apartment is on the top floor of the building, so you'll need to climb some stairs. Being on the top floor is great, as you'll receive heaps of sun and no noise from people above you and you are on the end so the bedroom is super quiet. Even though private and elevated, the apartment is located in a central city neighbourhood, so you'll be close by other residents. That’s not a downside, since the neighbours are generally a very considerate group of people, but you will be aware of their presence on occasion. Most people actually love it, since you will have a chance to meet locals and quickly strike up a conversation. Live like a local amongst locals and you will love your stay. The layout of this apartment with bedrooms on either side of the main living area make this a great choice for friends and colleagues travelling for work. The balcony was just made for alfresco eating and drinking. Directly north facing, it follows the sun from sunrise to sunset. The bespoke outdoor leaner sits under cover and gives comfortable seating and eating space for four. From here you can survey out towards the wide open skies and glistening of cars in the distance as they head towards the bridge. The mast tops remind you how close you are to the marina. All day light continues inside to the spacious living area with seating designed to kick back and enjoy the warm and changing light. Our fully equipped kitchen includes chef-quality stainless steel gourmet cookware, an Aga cast iron frying pan, and good quality knives. Choose from a selection of tempting Nespresso capsules. The bar leaner serves multiple purposes, either extra kitchen bench space, a dining table or somewhere to place your laptop looking out into the sky scape. The wifi is connected to an unlimited high-speed 100 Mbps fibre internet connection with complementary Netflix to enjoy your addictive series or latest movies. Both bedrooms give an outlook across the green urban landscape of Freemans Bay. Complete with large triple slide back windows, you can even enjoy the view (and the through breeze) from the living area. The luscious pocket sprung beds come with wool all-seasons duvets, high thread count sheets and a selection of soft, medium, hard and feather pillows. The furniture itself is mostly NZ designed and made. Other pieces are mid century originals. You may recognize the couch design. That's because it is an iconic design and build of Geoff Thurgood. He modelled it on the classic NZ bach couch and called it the 'Chester' after Garth Chester, an Aucklander who many called NZ's answer to Ray and Charles Eames with his mid century designs. Sink back into the lush chair. It's also a Geoff Thurgood, covered with an opulent Mokum fabric, also a NZ company. In the bedroom the bedside tables are Susan Robinson Design from Whenuapai, West Auckland, the beds NZ Design Mobel.